I love learning about new beauty brands. I've been blogging about products for so many years now that it's really refreshing to discover something different -- especially when the new (to me) brand also has a product I haven't tried before. Such is the case with Verso Super Eye Serum. The Latin word, "verso" means reverse. And that's exactly what Verso aims to do with every product in the line. Verso works to make skin appear younger and healthier with a formula that helps skin cells mimic how young cells behave. This happens thanks to a formula called Retinol 8, which stimulates the skin's production of collagen and hyaluronic acid. Sounds pretty great, right? But I know what you're really wondering ... does it work? Well, with Verso Super Eye Serum it certainly does! My eye puffiness, dark circles and lines have all been dramatically reduced since using this serum every night. I'm honestly pretty astounded at how much younger the area around my eyes appears now! I had never used a serum on my under-eye area before trying Verso Super Eye Serum. I've always gone for rich, thick creams. But I love the lighter, gel-like texture of this serum and the cooling effect it has upon the skin -- it's especially lovely right before climbing into bed each night. 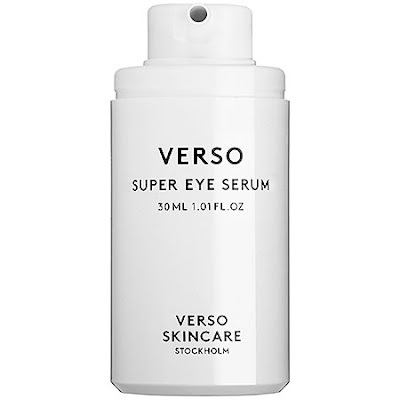 Verso Super Eye Serum retails for $80 at sephora.com. Looks like a terrific product.